It’s Friday morning and I’m gathering ingredients to make spaghetti sauce. I chop onions, mince garlic, and add them to the large pot simmering on my stove. I saute and chop some more. The celery and parsley go in and the aroma fills the entire house. Soon the crock pot will be simmering with beautiful red sauce and the meat will be formed into perfectly, imperfect balls. I take my boys to the library to unwind, to rest and rejoin our hearts from a week of schedules and routines. We breathe together the mountain air, wave to familiar faces, and read stories curled up on the floor. As the sun turns on its axis and begins its descent into the west, we head home, and I heat up the frying pan for meatballs. My littlest boy naps and my biggest boy reads stories quietly. It’s the day when I spend time preparing our home for friends and fellowship. I pull out our best dishes, which are just gold rimmed plates I got off the clearance rack at Wal-Mart. My almost four year old gathers forks and napkins to set the table. My husband pulls out the extra folding tables and chairs. My youngest wakes up and sips milk from his cup staring wide eyed as the house transforms into a place awaiting its favorite people. I gather the wine and the communion crackers from the cupboard. I pull out the little cups and grape juice for the kids. My husband wipes down the bathroom sink and shakes out the rug. My oldest gathers extra toilet paper and straightens the play room. It’s not long before the door opens, no one bothers knocking, we know they are coming. Little boys rush off to the play room to be superheroes, little girls come in holding Mommy’s hand, and food lines our buffet to overflowing. Glasses are poured and conversations erupt around us. It’s Friday Night Meatballs. And it’s a weekly tradition. It’s the one day of the week that has rhythm without fail. It’s a day set aside for friends and food. For slowing down and gathering together with believers to refresh. During our month long road trip, my husband and I talked a lot about hospitality and what God desired for us in this season. We talked about community and our desire to go deeper with those the Lord brought our way. We talked about our desire to share communion regularly with the body of Christ. We talked about helping Christians, broken and bruised, to find fellowship in a town that is 90% unchurched. We talked about slowing down and connecting our hearts to others. We talked about tethering our lives to people who love Jesus and love our community in a deeper way. It struck a chord with my heart. It slowed my mind and simplified my desires. Of course. It’s all in a simple act of gathering. A simple act that we’ve been doing for over a month now. The gathering of believers is neglected far too often because we’re too busy. We rush from place to place, saying yes when we should say no, and believing that opening our homes is too hard. 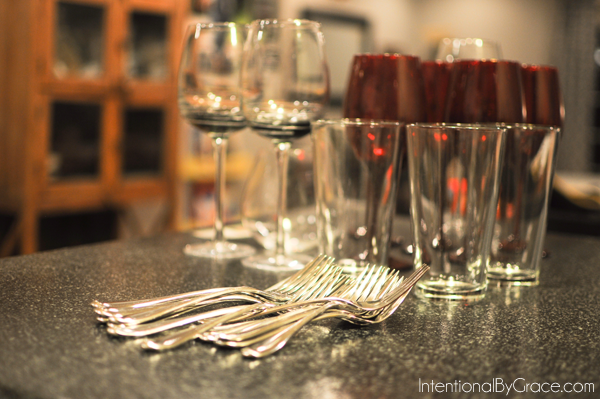 Sharing a meal with friends is an intimate and profound way of living out the Gospel in our homes. Sharing a meal is simple. There is a richness to breaking bread and sharing communion. Of remembering. Of confessing. Of sharing. Conversations are rich when faces are familiar. People are hungry. I want to offer them the Bread of Life. I want my home to be a place that makes it impossible to not think about God. I want my home to be a place of refreshment and community. A place where you can be you, the you God created you to be. Each week, we pull out all the chairs we own, we light the candles, and we serve up pounds and pounds of noodles. We do it because we decided to make a change. We decided to stop being so busy. We decided to commit ourselves to one night a week of regular fellowship with whomever the Lord brings our way. Much to our surprise, people got really excited. We had no idea how much this idea would resonate with our friends. We sent out our first email, tentatively, cautiously. Awkwardly? So here’s what Mark and I have decided to do: we are instituting a new tradition we call Friday Night Meatballs. Starting this Friday, we’re cooking up a pot of spaghetti and meatballs every Friday night and sitting down at the dining room table as a family—along with anyone else who’d like to join us. You are welcome at our table. We’ll just ask that you let us know by Thursday night so we know how many meatballs to make. You can bring something, but you don’t have to. Kids, gluten-free types, etc. will all be taken care of. The house will be messy. There might be card and/or board games. There might be good wine. You might be asked to read picture books. You might make new friends. We’ll just have to find out. This is our little attempt to spend more time with our community and be refreshed. To break bread, share communion, and just breathe together in a body of believers here in our valley. Kids are welcome and encouraged. If you want a night out, that’s fine, but this is meant to be a family affair. 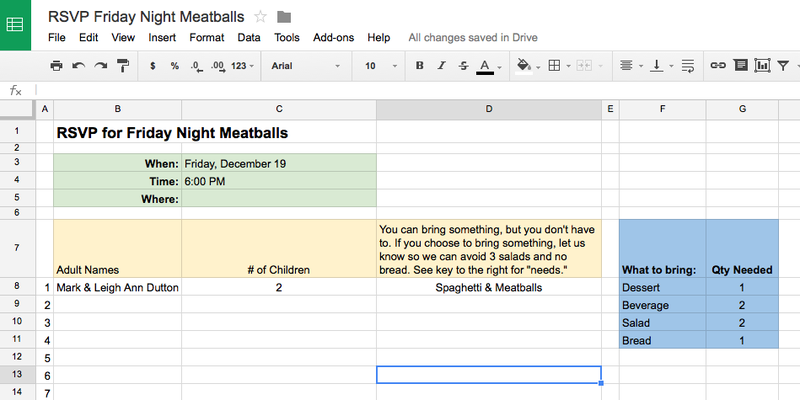 If you would, please add your name to the Google spreadsheet and let us know if you want to bring something, it will help us plan ahead (meatballs, chairs, etc.). We look forward to hanging out with you, and we pray you have a blessed week! The emails and text messages flooded our inboxes. People were saying this is exactly what they have been wanting, hoping for, and desiring for so long. We were living our dream. The first week we hosted … felt awkward and yet it also felt so refreshing. The mold of busy had been broken and it felt weird. Really weird. But we were committed. We were sharing communion with believers outside of Sunday mornings. We were sitting around a table with people who loved Jesus and loved our family. It was a little like a dream. We were living one of our dreams. A dream that someone once told us we’d never find because it didn’t exist, it wasn’t reality. Yet here we sit, week after week, sharing communion and eating spaghetti and meatballs with people who are starting to feel like family. And each week gets easier and easier. Yes, the cast of characters change from week to week. We have regulars who never miss, but we also have families who can’t always make it. Friday Night Meatballs isn’t a small group. It’s not a community group. It’s not sanctioned by the church or in the bulletin each week. We don’t open our Bibles and break down scripture passages. But we talk about God, our faith, our struggles, and our lives. We love one another in a way that really can’t be explained but experienced. I don’t know each persons favorite color or even their birthday, but each week we gather, break bread, and fellowship. Friday Night Meatballs is multi-generational, representing various seasons of life, and diverse in ethnicity and job statuses – all mixed together into a melting pot of friendships. To me, it’s a little like what I expect Heaven to be like. I’ve been asked a lot about the details of our Friday Night Meatballs. I’ve shared pictures on Instagram each week: the meatballs or sauce or a little boy folding napkins. And the questions are always there, begging for answers. Q: How do you know who to invite? A: It depends on what kind of gathering you are going for. I really love Sarah Grey’s approach. You have to read her post. We really battled how to approach the guest list. Our tendency is to invite the whole town and pray the Lord would make our house bigger if everyone shows up. He did part the Red Sea, didn’t He? But as we contemplated God’s gifts He has given us, the needs in our community, and yes, the size of our home, we had to get more specific. Selective? For us, we decided on inviting believers who we knew were seeking fellowship, had been burned by the church, or shared our passion for our unchurched community. We also didn’t want it exclusive to just our church body. We wanted diversity and we wanted real, raw relationships. Q: How do we invite people? A: You can use a variety of ways, but my favorite is simply by email and a Google spreadsheet. Each week, guests fill in this simple spreadsheet, and then each week I erase it and start again. I set up a canned response in Gmail so I’m not re-typing the same email each week. I also created a group contact list with everyone’s email address so I don’t have to remember everyone’s name each week. It’s another week of Friday Night Meatballs, and you’re invited! If you would, please add your name to the Google spreadsheet and let us know that you’re coming and if you want to bring something. It will help us plan ahead (meatballs, chairs, etc.). We look forward to hanging out with you, and we pray you have a blessed week! Other ideas include evites, Facebook groups, and text messaging. It depends on your style and group needs. Just keep it simple. Don’t over think it. Q: Will I get tired of meatballs? A: I was worried about this. I never make the same thing twice for my family. The thought of eating the same thing on the same night each week made me want to hyperventilate. Just being real. But I’ve found that it’s comforting to eat the same thing often. Plus, I make a mad spaghetti and meatballs. 😉 No one seems to be tired of it yet! 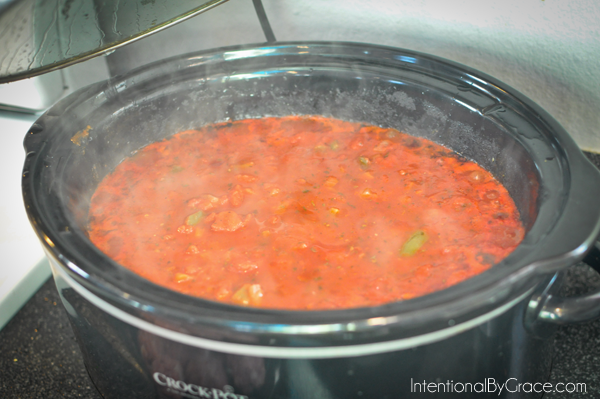 Q: Do you have a recipe for your spaghetti sauce? A: I do, I’ll share it soon. Stay tuned! 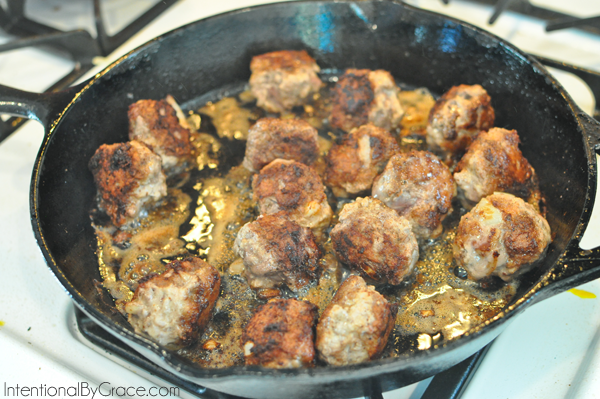 Q: Do you have a recipe for your meatballs? Q: How do you share communion? Is that awkward? A: It was super awkward at first. I won’t lie. My husband leads it each week, and each week it gets easier and easier. It’s not common (unfortunately) to share communion outside of Sunday mornings. BUT people crave it, desire it, want it. We keep it very simple. I buy communion crackers and grape juice. Both of which last for a long time. Everyone takes a glass or communion cup with either wine or grape juice, whichever they are comfortable with, and a cracker. I will note that we invite the children to partake as well (parents permission for children that don’t belong to us, of course!). For us, we welcome them to the table. I know everyone does this differently. I explain our stance more in my curriculum for toddlers. 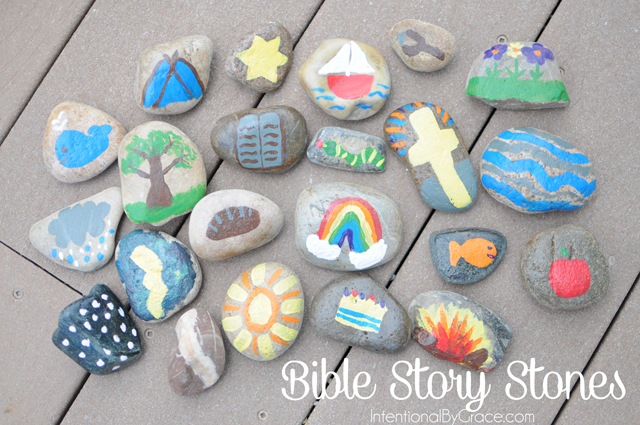 I believe it is an opportunity to present the Gospel to our children and give them something tangible to relate it to. My husband then reminds everyone of why we do this, in remembrance of Christ’s body and blood shed for us, and we all share a moment of silence and prayer; then partake together. We share communion before the meal standing in a circle, semi-circle, wherever we can find space. Q: Why do you not make it easier and use paper plates? Also, it’s cheaper to ditch disposables (no pun intended), and as a work at home family and entrepreneurs, we can’t be wasting our precious cash! Q: Do you have a kids table or do they sit at the table with you? A: Both. We’ve done it both ways, but we are going to eliminate the “kids table.” We found it too hard to make sure they were eating their food. For our kids, they get incredibly hungry after everyone leaves or they pig out on cookies later when dessert comes out. Neither option works for my family, so we’re going to require our children to sit with us at the table. Plus whoever happened to be beside the kid table always ended up wrangling them alone. It just wasn’t fair or conducive to what we were trying to accomplish. Q: What do you do with the children? What does it look like with toddlers and babies involved? A: We have a play room dedicated to children’s play. We let the parents decide if they feel comfortable letting their children play upstairs while the adults hang out in the living. The children are coming and going from the play room and babies just play wherever Mama is at. We have a few toys available downstairs, but for the most part, all toys and rambunctious kid-ness takes place in the play room. Oh, and I have a chair in our boys’ room for nursing mothers. Just make sure there is somewhere private if you have guests that are still nursing babies and want somewhere quiet to care for their child. Q: Do you really sit around your dining room table? A: Yes we do. We add an additional long table next to our dining room table to make it one long table. Occasionally people have to sit on the couch around the coffee table, but we try to avoid that. Q: Is your home ever really messy? Q: What if something comes up on Friday? What if I have a baby? What if someone is sick? I have no idea. We plan to take this as it comes. Right now, I can say we think our plan for sickness will be to quarantine into the master bedroom whomever is sick. We don’t have all the answers. One week at a time, right? Q: How do you keep people’s cups and glasses from getting mixed up? I originally thought about solo cups with markers – write your name on the cup. But remember why I don’t use paper plates? Same reason applies here for solo cups. I didn’t want to fork over the expense each week for disposable cups that people had written their name on. Then I was asked to review a really cool product from another family-owned business. Insert: DrinkBands! Seriously? These things are amazing! I didn’t give a DrinkBand to each person. I wanted to run a test. What I noticed surprised me because I had never really thought about this being a problem before! 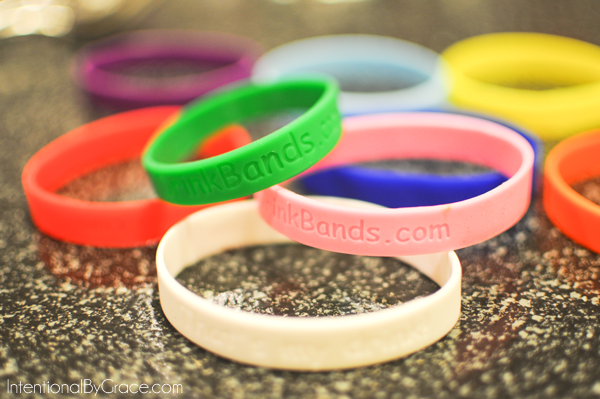 Not to mention, DrinkBands can be used for everyday life too. One glass per person per day. Put a DrinkBand on it to know whose is whose! 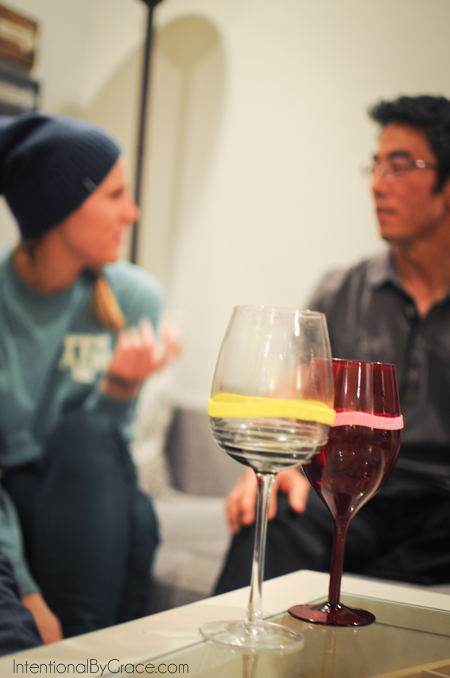 Want to get DrinkBands for your next gathering? You can find out everything you need to know here. I’m thinking about getting the personalized DrinkBands for my family. Or perhaps a personalized set with names of my guests for Friday Night Meatballs. Now, there’s an idea! I seriously LOVED this post so much. Inspiring AND practical… and beautifully shared. Love your heart in this, LA. xoxoxoxoxo. Leigh Ann, I cannot say just how much I love this post and how much it resonates with me! This is so my heart– opening up our home to family and friends and strangers consistently and frequently. It was my heart when we picked out our home (big dining room and convenient kitchen, large living areas, not worried about big bedrooms). My father-in-law even built me a LONG farmhouse style table and a bench so that lots of people could gather together for a meal. It has been hard, though, to build consistent community in our new town (we’ve lived here for 3 years). Reading this bought tears to my eyes because I long for this so much. I’m going to pitch it to my husband and hopefully start something similar after the new year. Your house sounds like ours (and the reason why we chose it!). We’ve been in our area for 3 years too, and we were having the same problem, which is precisely why we started the tradition! Yes, send me his info, and my hubby would love to reach out! I absolutely love this. I’ve been hungering for something new in my life, certain that God was leading me toward something new, some new kind of ministry. I was just praying that God would help me use my home better for outreach and though I need to pray some more, I think this might be the answer. Thank you so much for sharing this idea and your experiences. Hi Leigh Ann! A relative of mine came across your post and sent it to me. Thanks so much for your kind words, and I’m so pleased that the idea has worked out so well for you! We’re launching a “meatball map” on http://www.fridaynightmeatballs.com to show how Friday Night Meatballs is taking off all over the world. I’d love to include one of your photos, if you’d be interested! Whereabouts are you located? My email address is above if you’d prefer to contact me privately. Thanks, and I hope you have a wonderful dinner and a great holiday. Absolutely love this idea and am going to send out this email to some friends! Wonderful! Share away 🙂 Thanks for commenting! My husband and I are hosting our first Saturday Night Spaghetti this month!!! Thank you for the encouragement! I was wondering when you would share your recipes!!!? Thanks so much friend! This is wonderful news! I’m working on the post now. I hope to share them this month! I’m curious about the communion. I was brought up and still am immersed in formal church liturgy with all that pomp & flourish, love it. Do you prepare the crackers & wine in any special way? Have them blessed by clergy? 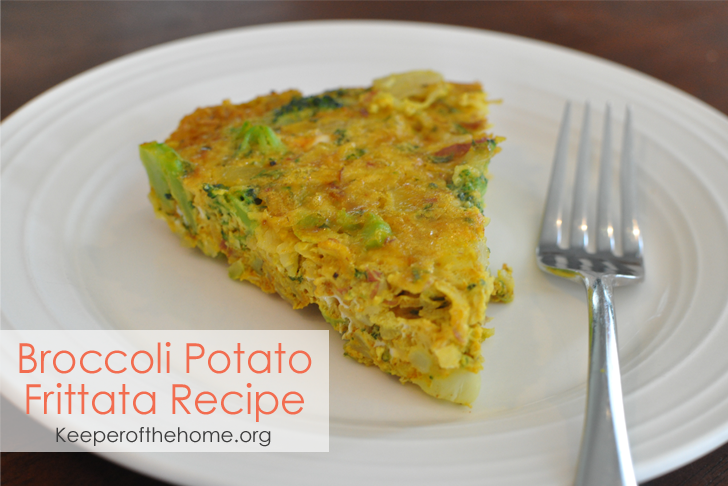 Or is it super informal and simply prepared with love & prayer to share with your guests? I’m sure I’m overthinking this, but I feel like I’m above my pay-grade on this element of FNT! Our first one was great! We only had one other couple, but it was the perfect start. We decided to widen the net for invitations after some prompting from the Holy Spirit and slightly decrease max capacity after 4 adults and 3 kids really filled up our living room (yay 90s floorplans! 🙁 ). My husband is even going to host alone this week since I’ll be OOT. Definitely something we are excited to continue and grow! This is a great idea! I wish I could do something like this….we are in a tiny apartment so it really wouldn’t work….LOL! But, if I ever get a bigger place I am giving it a try! We are in a season where big groups are difficult. 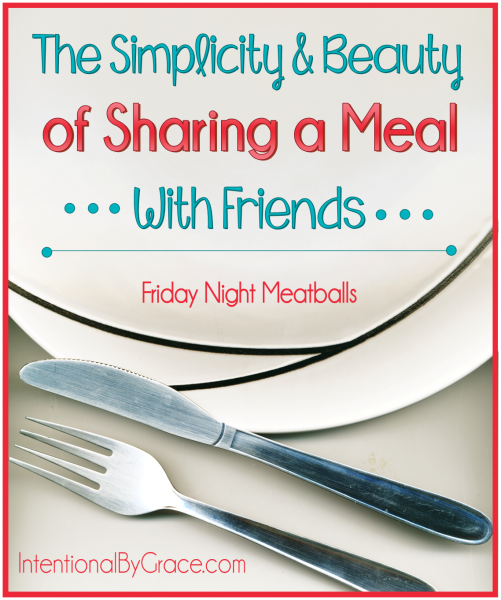 We are thinking about just making Friday nights our “hospitality nights.” So, we do the meatballs every week but rotate the cast with a smaller invite list – perhaps just one family? Just an idea, but definitely tuck the big shebang away for later! It’s wonderful! Leigh Ann – I read your post a few months ago, and thought “Wow – that is a cool idea.” It jelled in my mind for a time, and then I shared it with my husband. You see, we are newly married (July 0f 2015), and I moved from Massachusetts to Indiana, picking up my life to move into a community where I knew no one except my new husband. After 28 years in the same church, living in the same community for 55 years (with the exception of 3 years in Wyoming right after college), it was a stretch! We attend a much smaller church here in Indiana, I’m not the pianist, and I’m not teaching school. I’m a stay at home wife, supporting my husband and the ministry he is involved with. 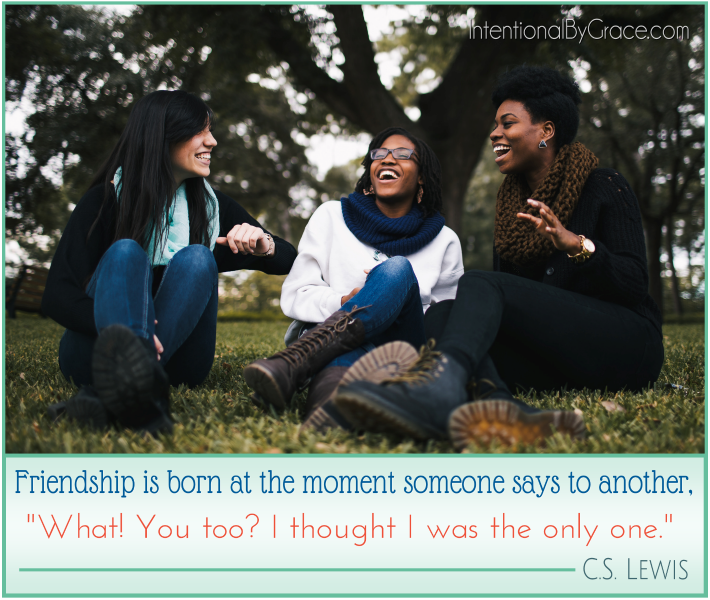 (Plus – he travels out of the country one week per month…) Week after week, I longed for friendships to begin, for relationships to build. We prayed that God would reveal to our hearts what HE would have for us – here – in this new season of our lives. Slowly, God began to reveal HIS heart as our were prepared to minister. I began meeting with two young women, to discuss a book that we all started reading together. I invited women out for coffee, or for lunch. I asked women over to my house for a simple lunch of tomato soup and grilled cheese – on Swedish rye bread, of course! Two months ago, we had our first “Friday Night Meatballs.” We invited three couple from church that we didn’t know well. An evening of laughter, and stories, and sharing food! The next month, we invited three other families. Another evening of laughter, stories, and sharing lives and food. Last Friday night, we had another three families over. They didn’t know each other – but they did by the end of the evening. What a blessing to see them greet each other on Sunday – giving hugs to people that they didn’t know the week before! While our Friday nights may look totally different from yours, the heart of the matter is: community. We intentionally invite people of different ages, different family makeup, and that may not know each other. God has blessed us with a home that works so well in this simple way of entertaining. Due to my husband’s travel schedule, we can do this once or twice a month, but it will be a part of the fabric of our marriage and home. We are blessed! Thank you for writing about this, as it has been a catalyst in helping us determine what “us” looks like! Part of that is opening our home to a simple real and rich fellowship! This is so beautiful. My eyes glossed over with tears as I read your story. What grace! What amazing grace! I just love this. Thank you for sharing! You caught the vision of the post beautifully!